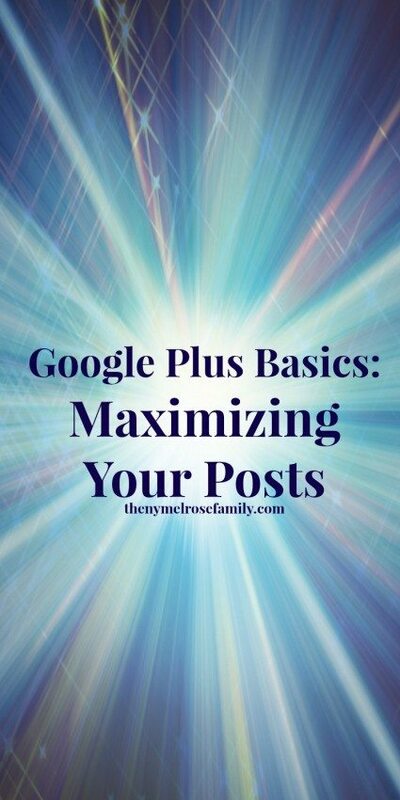 If you’re new to the Google Plus Basics Series, you’re going to want to go back and catch up, but make sure you come back and check out this video because I’m showing you how to create a post organized to maximize your exposure and increase the chances of interaction. If you’re going to put the time into G+, or any social media for that matter, it makes sense to maximize your time there. As small business owners, we don’t have a ton of time to waste on social media. Although, it certainly happens every now and again. Winks! Therefore, for 6.5 minutes of your time, I’m going to save you hours in return! Don’t forget to subscribe to my YouTube Channel so that you gain early access to all of the videos in the series. 1. Upload your photo using the camera icon. You want to have a large photo that catches people attention, that’s part of the reason that we love Google Plus so much. You get a chance to show off your gorgeous photography skills and catch people’s attention. 2. Bold your title. Start out with your title in bold by using asterisk directly next to the first letter in the title and the last. So it will look like this, *Really Interesting Title*. 3. Descriptive introduction. Share who you are. Remember how we talked about growing that audience on Why You NEED to Get on G+? Here’s how it can happen. Let people know who you are. Share the story behind the article. You don’t want to lead with, “Here’s the latest post”. Boring! You lost me at Here. I’m not looking for orders. I’m looking for the story behind who you are. The description is a great place to get some keywords in as well. Don’t go crazy. You want it to be authentic. 5. Add hashtags. Provide some hashtags. Don’t go crazy though. You want to add some though or G+ will try to determine what the hashtags should be. When you’re writing your hashtags, pay attention to the hashtags that G+ is offering when you’re typing. They list them according to most popular. It’s kind of like a pop up keyword tool within G+. 6. Post to PUBLIC. Green means GO! If you take away nothing else from this article, PLEASE apply this ASAP. You do not want to post to your circles because your circles are people that you follow, they may not even know who you are. Every time you share your circles, those people are getting a notification that you’ve shared a post with them. This is one quick way to get muted because the majority of people have their notifications come to their email and most people don’t want to know when you share a new post. They want to find it on their own accord. Jenny: There’s a little button on my G+ post box asking if I want to email each person in my circles with that post. I have never checked it. Does that mean my Circles are still receiving email notifications with each of my posts? Your circles may not be receiving the email, but they are definitely getting a notification. You have to remember that your circles are who you follow. They do not necessarily follow you. Jenny I’m really enjoying this series – such valuable tools. Thank You! You are so welcome Melanie. Thanks for stopping by. Thanks for the video. Simple and sweet. I picked up a few tips..thank you! I’m all about short and sweet Becky. As a mom, I know that you all don’t have extra time on your hands to be wasting. THANK YOU for posting this! I’m brand new to Google plus, and I’m kinda ‘shooting in the dark.’ These tips are much appreciated!!! Off to work on them now … If my boys will nap ;). Have a good weekend! Thanks so much Katie. I’m glad you’re finding them helpful and I hope your boys napped. I know my four year old can be hit or miss with the naps anymore and it makes it difficult to get things done. Thanks for the great info on how I can improve my Google+ posting – I learned a few new tricks! So happy to hear that Leigh Anne! Great tips here! Appreciate all the posts in the series as G+ only gets bigger!! I’m glad you found them helpful Ana. We’ll be forging ahead next week with how to share others content. Thanks Jenny! I appreciate the reminder- pretty much everything I know about Google+ I learned from you and OBC! That is a great video. It is very helpful. I’m looking forward to the rest of the video series. I need to use Google+ more. Hi Jenny, I just watched all four of your videos about Google+ and learned so many things I didn’t know. I subscribed to your YouTube channel so I don’t miss the next one. Great work – I really appreciate that you took the time to post them. Oh and I have a Google+ question that’s probably pretty simple but I haven’t seen the answer to it. On my page, what’s the difference between the number who’ve +1’d it vs the number who have it in their circles? Thanks, Jenny! Thank you again for more great information!! Hi Jenny. Thanks for all the useful tips! I appreciate you taking the time to share the secrets of your success with those of us who don’t get as much traffic! I’ve been watching your tutorials on Google Plus. Thanks for all of the great information. I’m still a bit of a newbie on Google Plus and your tutorials have really helped.